We decided to go to the RHS Tatton Park Flower Show again this year, for the third time, and were not disappointed. It was blisteringly hot, but well worth the effort involved, as there was lots to see and do, and also lots of opportunities to engage in conversation with people who breathe, eat and sleep plants. The Floral Tent was particularly good for the soul. Standing in front of a spectacular display of lilies, I wanted to sear that moment onto my eyeballs, to be recalled on a drear, grey day in November. My favourite marquee, however, is always the 'Plant Societies' one, as it collects together some of the most passionate, knowledgable people in the country, and then allows you to ask them endless questions ... and they love it ! In some cases I think passion verges on obsession, but, there is nothing wrong with that, as obsession and gardening go happily hand in hand. We were wandering around when we came across the 'British Pteridological Society' stand, where there were several very helpful and enthusiastic people ready and able to assist. 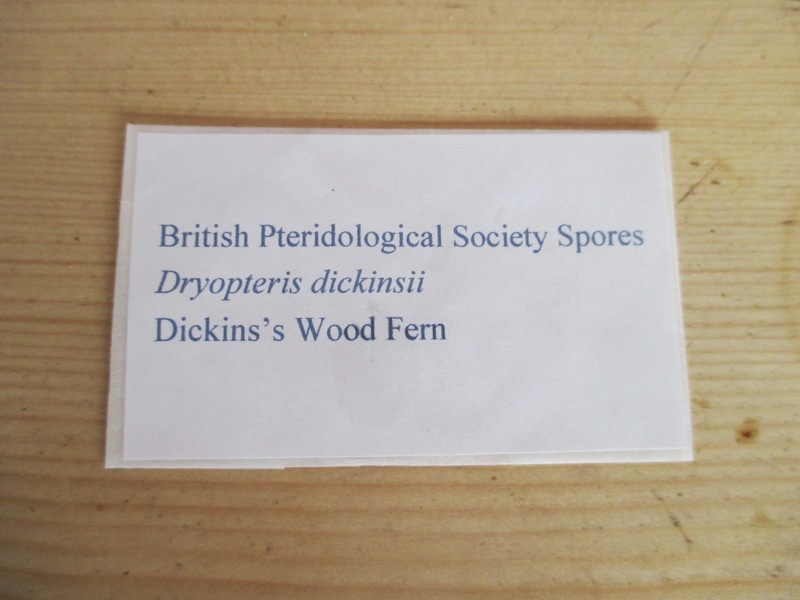 They do a fantastic thing on that stall, they sell tiny little envelopes of varieties of fern spores, for only £1.00 . 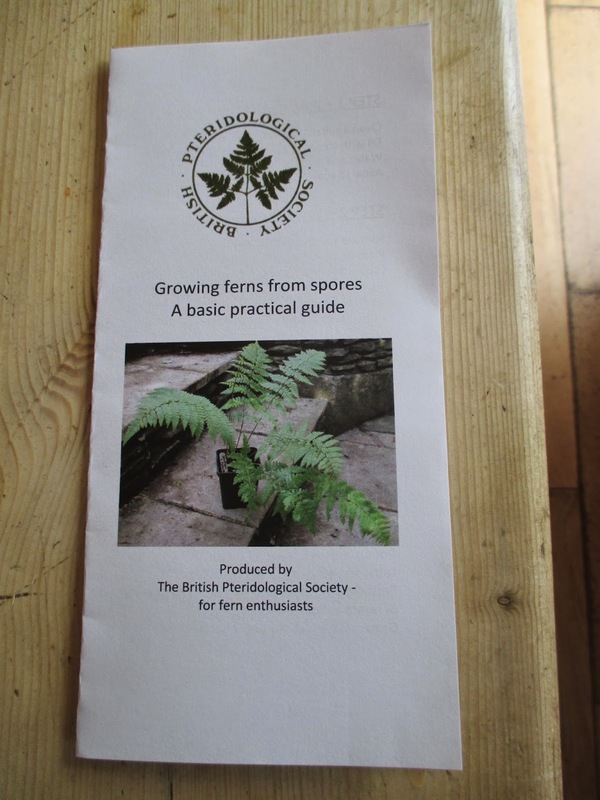 There is also a free leaflet which details step by step growing instructions, with photographs too ! It is very clear and concise and set out in a way which is easy to follow, and should enable the growing of proper big ferns from tiny spores ! 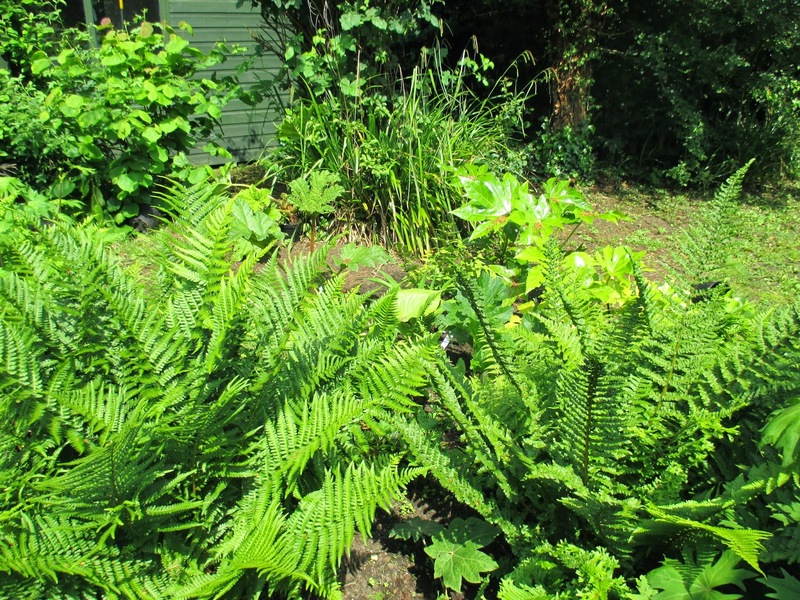 I took advice on which were the easiest varieties to grow, and decided on 'Braun's Shield Fern' (Polystichum Braunii) and Dickins's Wood Fern (Dryopteris Dickinsii) as someone on the stall had grown them recently with great success. I must admit I have tried all this once before, and bought spores plus instructions from a previous Tatton Show. May I say that I failed miserably, despite the excellent instructions. I nurtured a tray full of mossy little growths for over a year, hoping they would morph into little ferns at some stage. When they didn't, I threw them out, feeling very foolish that I had spent so much time tending some odd lumpy moss . When I got back from Tatton this time, I read my new Instruction leaflet, only to discover that the spores grow into prothalli which, erm, look like lumpy bits of moss. They are part of the life cycle of the fern. I assume I did not take the trouble to read my initial leaflet properly and because of this I discarded the immature ferns, which can linger for up to a year in that state before they put out fronds. Who would have thought it! So, this time I am sticking religiously to the leaflet and reading every word. 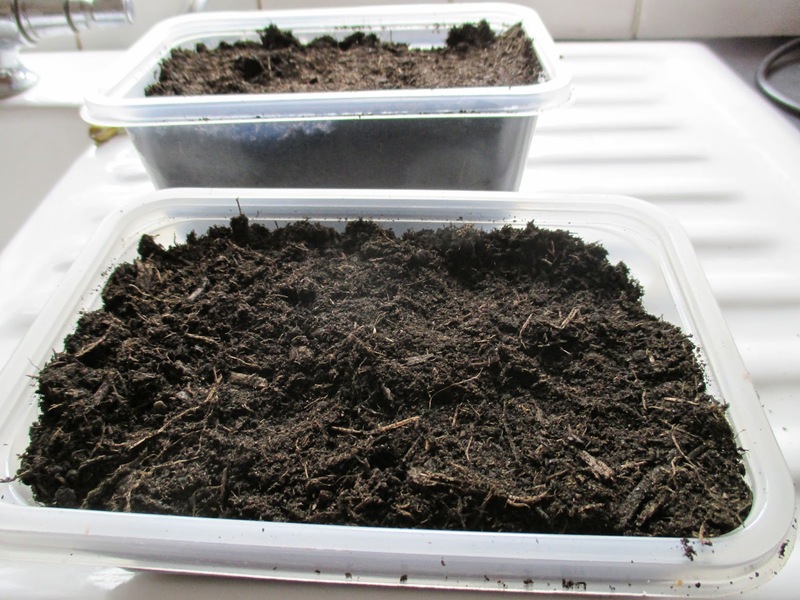 Fill 2 containers up to 1 - 3cm from the top, with a peat based compost. There must be good drainage in the container. 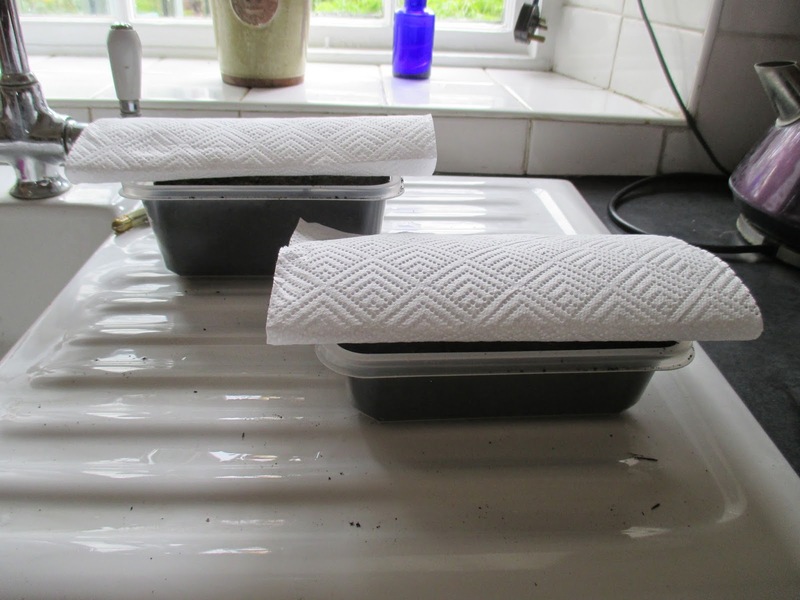 Weirdly, cover the surface with dry kitchen roll, to prevent contamination from weed seeds. 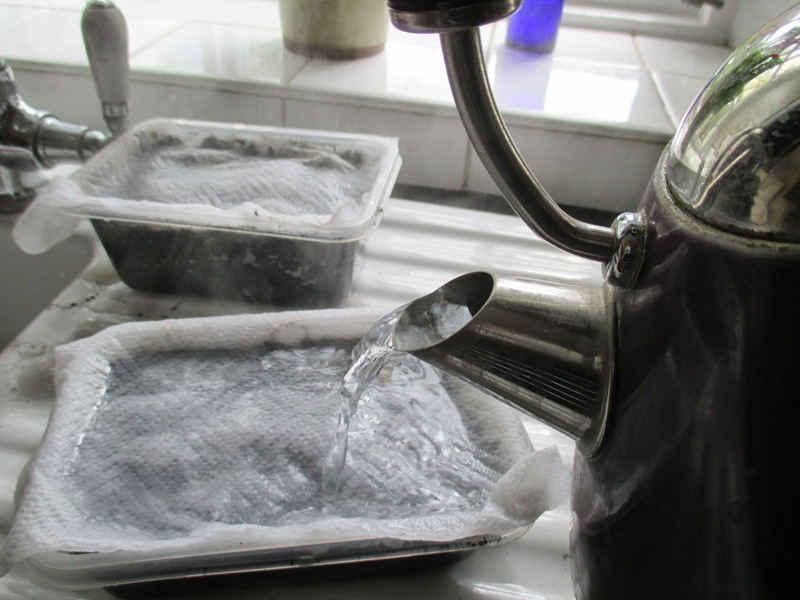 Sterilise the compost by pouring boiling water through it until it is all thoroughly wet. Leave until cool - which in my experience took a surprisingly long time. Discard the soggy kitchen roll before sowing. 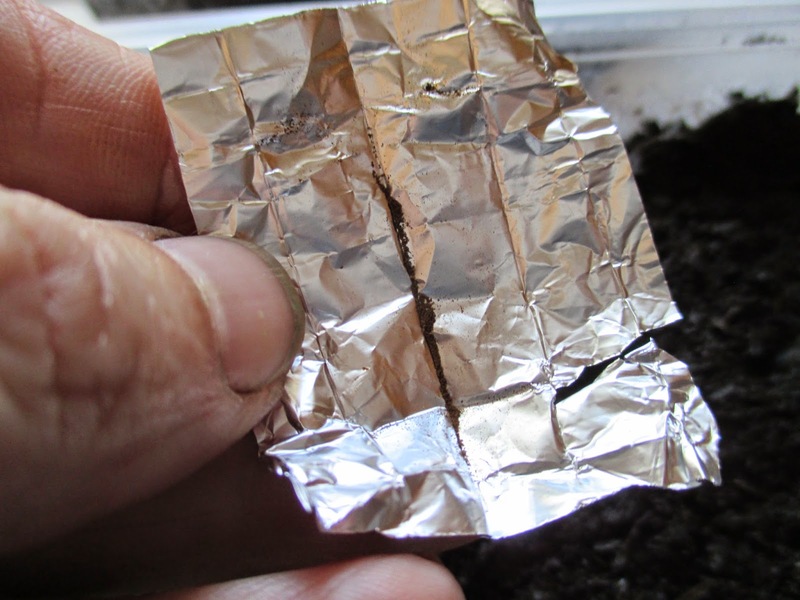 CAREFULLY open the foil containing the spores and try to distribute evenly over the surface of the compost. This is a bit of a leap of faith, as you have no idea where they are as they are so tiny, and totally invisible once they are on the surface of the compost. No sneezing at this point ! Also, please excuse composty hands and nail in the photo! 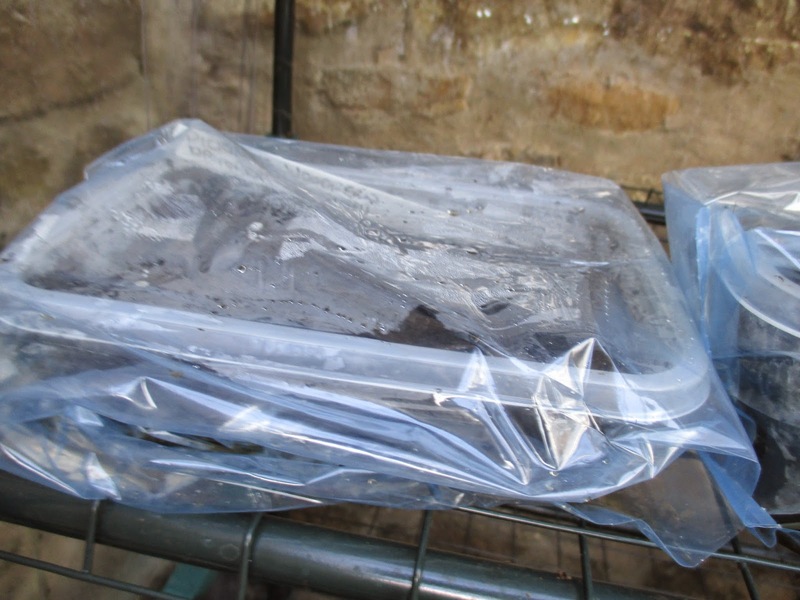 Make a cosy little micro climate for the spores by putting the container in a sealed plastic bag. Don't hold your breath ! It can be weeks, months or even over a year before germination begins. DO NOT lose faith and throw the whole lot away! The life cycle of a fern is not as you would expect, as the spores germinate erratically, to produce mossy like growths called prothalli. Recognisable fronds appear from these if you have the patience of Job and don't throw them away in error ! Hi Grace, nice to hear from you ! Hopefully , ferns for free , if all goes according to plan ! For a cost of one pound it is worth a shot ! What a shame Sue, so close to success ! I think they do like humidity as my leaflet says it can help to spray the little fernlets. It can't be so difficult, surely, if your Dryopteris can do it all on its own! Oh, lucky you to have a whole wood of them ! I love the smell too, and associate it with childhood. I've always fancied having a go at this, but heard it was tricky. And yet there are ferns all over the place here and I'm always digging up babies of the common one. It's fascinating. I just googled prothalli, I shall be looking out for them now. Hi Jessica, I had never heard of prothalli until I read the leaflet! I'm not holding my breath with this one , if I even get one little fern I shall be very pleased ! I'd be ever so proud if I could grow a fern. Oh, Lucy, so will I !! This is wonderful! I have a feeling that I would have lost patience after the second month and thrown the whole thing away, or maybe, composted it! Hi sunita, I lost faith too , far too soon. I think patience is essential where ferns are concerned ! What a great post Jane! 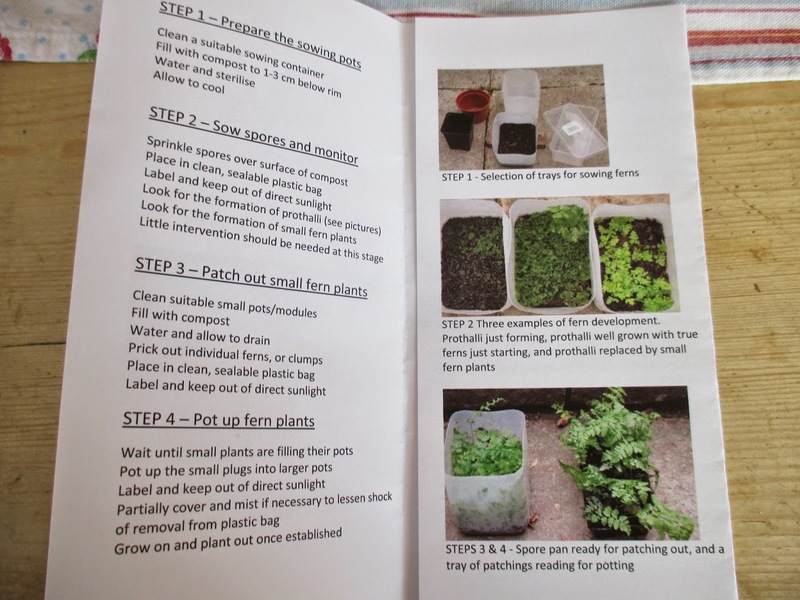 I have many ferns in my garden but have always thought propagating them to be a fiddly process, these instructions make it look fairly easy and I'm sure I can fit a tray of them into my growhouse. Of course, I have to collect the spores first! Hi Paula, go on , have a go, and then we can compare notes! 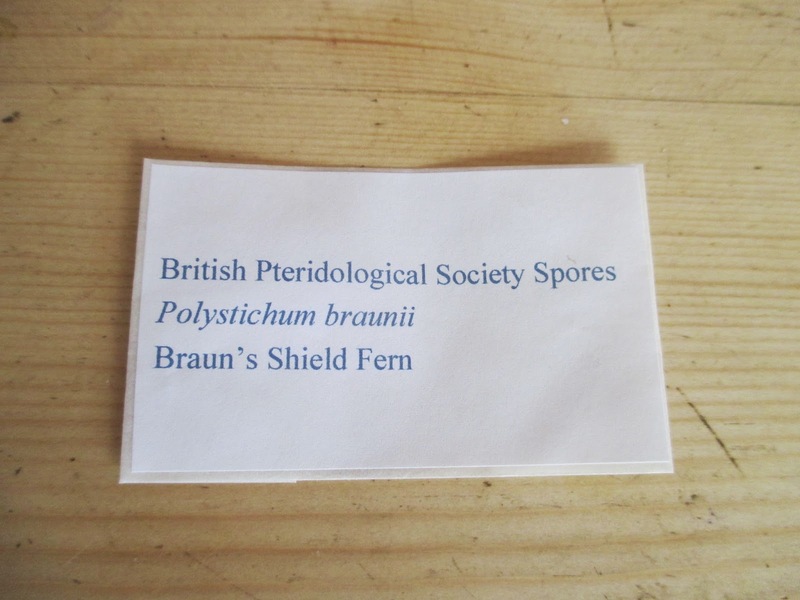 I have no clue how to collect the spores though - that bit wasn't on the leaflet ! I do hope I have a little litter of ferns before too very long! I hope your racoons find another target for their attention ! Jane, you're such patiently and can wait for sprouts long time! I 'm sure you'll have nice ferns. I have the Award for you Jane. Congratulation! I'm rooting for you (no pun intended), sounds like fun, do you have to keep watering the pots? Won't they grow moss, and if so, how do you tell the difference between that and baby fernlets? I am intrigued, it sounds potentially addictive. Good luck! I hope it works. I had no idea ferns pretended to be moss before growing up into ferns. Very sneaky!